The human intestine is a lengthy organ and for ease of diagnosis it is divided into two broad sections- the initial small bowel followed by the large bowel or colon. 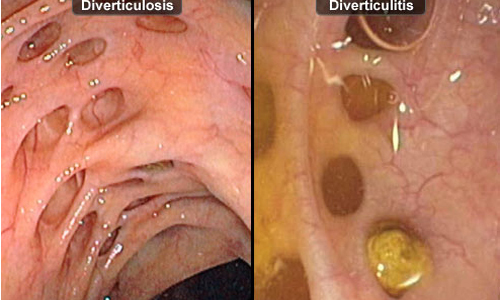 Diverticula are small pouches that bulge outwards from the wall of the colon, or large intestine. If these develop, the affected person is said to be suffering from Diverticulosis. These out-pouchings are harmless as long as they remain clear of any debris or inflammation. If these pouches become inflamed or infected, then it gives rise to an acute medical condition called as Diverticulitis that needs immediate treatment. Diverticula usually develop when naturally weak places in the colon wall give way under pressure during digestion if there is recurrent or chronic constipation, etc. This causes small, marble-sized pouches to protrude through the colon wall. Diverticulitis occurs when these benign diverticula tear, resulting in inflammation or infection or both. The main cause of Diverticular disease is a diet which is low in fibre. There are many other factors which are thought to contribute to its cause. Aging, obesity, smoking and lack of exercise increase the odds of developing diverticulitis. A diet high in animal fat and low in fibre also increases the risk of developing diverticulitis. The reason why these probably lead to diverticulosis is that they lead to constipation or poor clearance of faeces from the colon, leading to increased pressure within the canal of the colon. There are several drugs associated with an increased risk of diverticulitis such as: steroids, opiates and non-steroidal anti-inflammatory drugs such as: ibuprofen and naproxen. Most people with Diverticulosis usually don’t have symptoms. However, at times, one may complain of mild cramps, bloating or constipation. Diverticulosis is usually detected accidentally when tests are ordered for some other condition. The abdominal pain that is believed to be caused by diverticular disease is usually due to coexisting painful conditions such as Irritable Bowel Syndrome (IBS). It is usually more prevalent amongst the geriatric population. Diverticulitis, as discussed above results when the diverticula become infected and inflamed. Hence, the most common symptom is abdominal pain, usually on the left side. One may also have, fever, nausea, vomiting, chills, cramping and a marked change in bowel habits. Imaging tests like barium enema, abdominal CT scan, ultrasound are the best way of detecting Diverticular disease. Mild diverticulitis can be treated with rest, changes in the diet (a liquid diet is given more preference) and antibiotics. Severe or recurring diverticulitis may require surgery for removal of the inflamed diverticulae. Around 25% of people with acute diverticulitis develop complications which include: an abscess when pus collects in the pouch, a blockage in the colon or intestine caused by scarring or Peritonitis i.e. inflammation of the abdominal lining due to bursting open of the diverticula, or an abnormal passageway known as a fistula between sections of the bowel or the bowel and bladder. Most individuals possessing colonic diverticulae are unaware of them for lack of pressing symptoms. The condition of having colonic diverticulae is called as diverticulosis. They are most often discovered accidentally during an imaging procedure. At times, these diverticulae may become inflamed or infected leading to the development of a condition called as diverticulitis. Complications rarely occur. But, if they do, they are usually of a serious nature. A diet low in fiber is believed to cause diverticular disease. Therefore, increasing the fiber content in diet may help prevent it. rachita. "Difference between Diverticulosis and Diverticulitis." DifferenceBetween.net. January 14, 2015 < http://www.differencebetween.net/science/health/difference-between-diverticulosis-and-diverticulitis/ >.